victoria bc - no additives. no preservatives. lots of love. In 2008, Raven, my Lab/Collie-x, survived 10 days of around-the-clock emergency care (acute pancreatitis), surgery, a year of cancer medication, and my incessant worrying. It was an exhausting climb back to health, but Raven recovered, and she inspired Beardog Cafe’s gingerbread dog treats. Raven couldn’t digest store-bought treats without her pancreatitis flaring up. When Raven’s health stabilized, I decided that she deserved delicious, easy to digest treats. That’s when I made Raven gingerbread dog treats, and she loved them! More importantly, she could digest them. My other dog, Beardog, inspired the name, Beardog Cafe.That’s how Beardog Cafe started – with love for my dogs. What do we put in our treats? Beardog Cafe treats are made with all natural ingredients: rye flour because it's low in gluten, black strap molasses because its high in nutrients, and ginger, cinnamon and cloves to help with digestion. 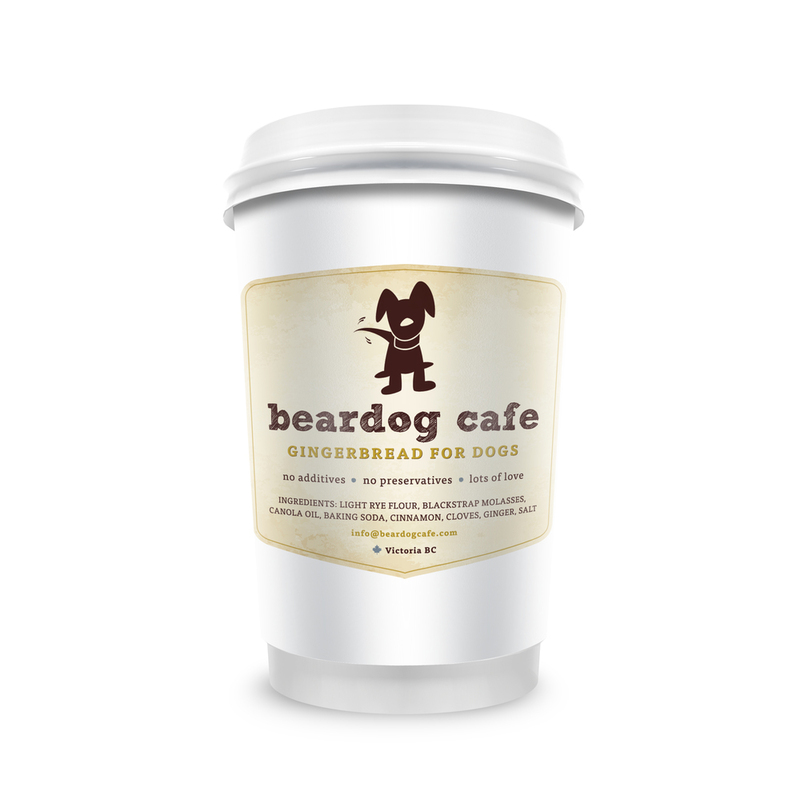 Best of all, Beardog Cafe treats are packaged in coffee cup packaging - super cute! We sell direct to you and deliver across Canada. What we save in wholesale fees, you save in purchase prices. Stay tuned for Beardog Cafe events! Ingredients: rye flour, blackstrap molasses, canola oil, cinnamon, ginger, cloves, baking soda, salt. Treats can be stored in an air tight container at room temperature for up to one year. Approximately 25 x 2" treats. Packaged in coffee-cup packaging. Approximately 60 x 2" treats. Packaged in coffee-cup packaging. Approximately 150 x 2" treats. Subscribe and receive Beardog Cafe dog treats monthly, bi-monthly, or quarterly and save. Available only in 1.5 lb bags. Treats can be stored in an air tight container at room temperature for up to one year.